This example shows how to analyze 3D data using the three-dimensional wavelet analysis tool, and how to display low-pass and high-pass components along a given slice. The example focuses on magnetic resonance images. A key feature of this analysis is to track the optimal, or at least a good, wavelet-based sparsity of the image which is the lowest percentage of transform coefficients sufficient for diagnostic-quality reconstruction. To illustrate this, we keep the approximation of a 3D MRI to show the complexity reduction. The result can be improved if the images were transformed and reconstructed from the largest transform coefficients where the definition of the quality is assessed by medical specialists. We will see that Wavelet transform for brain images allows efficient and accurate reconstructions involving only 5-10% of the coefficients. 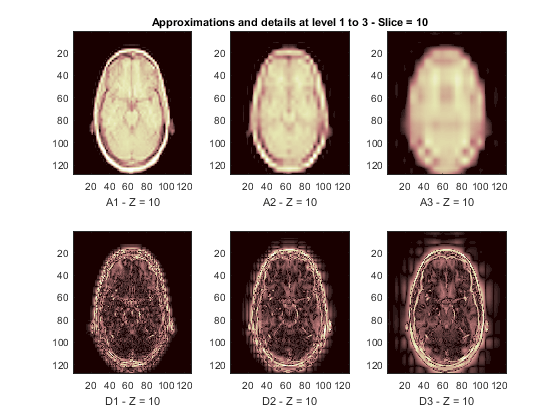 First, load the wmri.mat file which is built from the MRI data set that comes with MATLAB®. 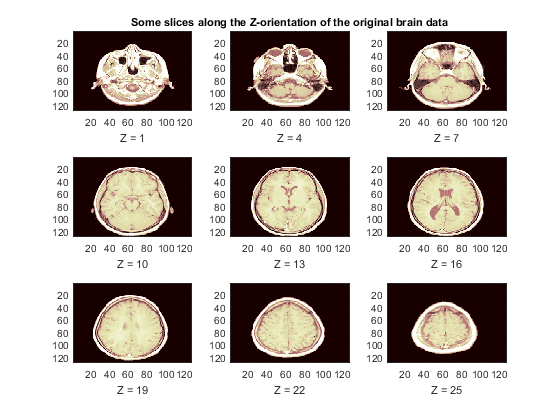 We now display some slices along the Z-orientation of the original brain data. 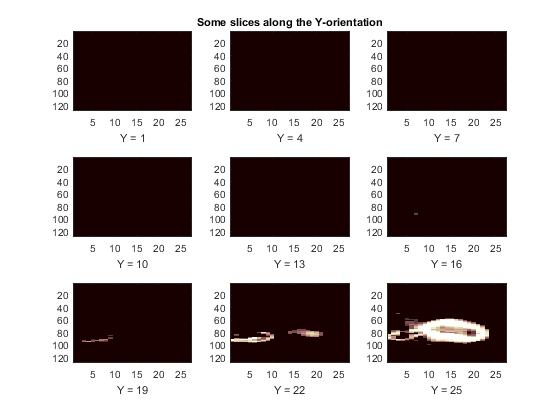 We now switch to the Y-orientation slice. 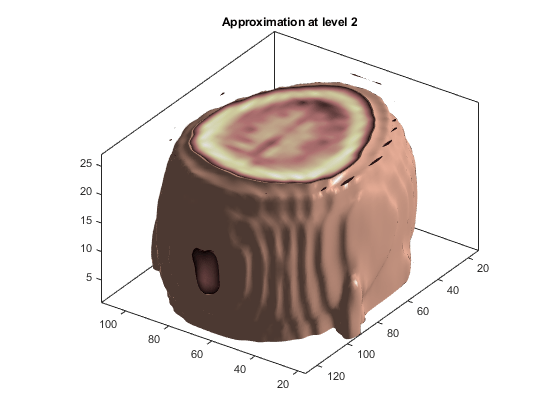 Compute the wavelet decomposition of the 3D data at level 3. WT = wavedec3(X,n,w);    % Multilevel 3D wavelet decomposition. Reconstruct from coefficients the approximations and details for levels 1 to 3. The reconstructed approximations and details along the Z-orientation are displayed below. The size of the 3D original array X is (128 x 128 x 27) = 442368. We can use a 3D display to show it. The 3D array of the coefficients of approximation at level 2, whose size is (22 x 22 x 9) = 4356, is less than 1% the size of the original data. With these coefficients, we can reconstruct A2, the approximation at level 2, which is a kind of compression of the original 3D array. A2 can also be shown using a 3D display. 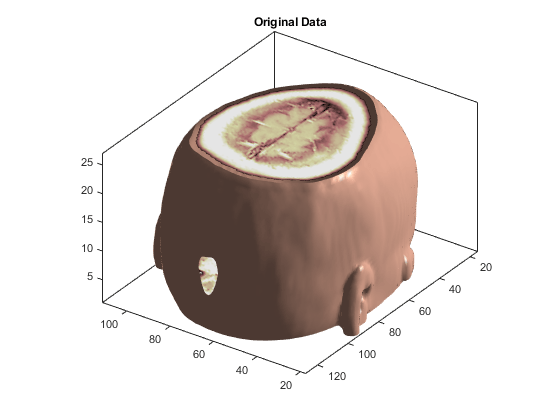 This example shows how to use 3D wavelet functions to analyze 3D data. The Wavelet Analyzer app, waveletAnalyzer, lets you perform the same steps more easily, such as simulating 3D visualization using an animation across different slices.